Big Ten Conference officials sent a telling series of signals to longtime TV partner ESPN on Wednesday. ROSEMONT, Ill. — Big Ten Conference officials sent a telling series of signals to longtime TV partner ESPN on Wednesday. Later, Big Ten commissioner Jim Delany had a 35-minute roundtable discussion with the media and shot down any intimation that his league was on the verge of leaving ESPN when its 10-year football deal with the cable behemoth expires soon. The Big Ten’s media-rights negotiations are being watched closely, for the money involved, the length of the contracts and which networks end up being included or excluded. 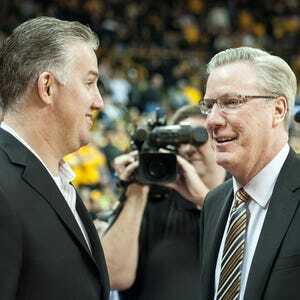 Delany is reportedly looking for revenue of $500 million annually, which could provide a windfall of upwards of $44 million per year for each of his schools, which include Iowa. Delany refused to confirm any media reports, primarily from the Sports Business Journal, on the topic so far and said that the Big Ten expects to have “a series of announcements” this summer. That gives more weight to what Phillips said. It can be read as either a threat to ESPN — which reportedly made a low-ball offer to the Big Ten that Fox Sports surpassed in order to get a six-year contract for half of the league’s media rights — a warning to consumers (and Big Ten basketball coaches) to brace for a seismic change in their viewing habits, or merely a negotiating ploy to entice a higher bid. Delany acknowledged that finding the right length of the next media contract is a tricky balance between locking in to guaranteed money, yet also being able to hit the market again before other major college conferences do in case the potential payouts keep escalating. “You can be sure that those with great, great content will always, relatively speaking, be treated pretty well,” Delany said. He also went out of his way to praise Fox, which owns 51 percent of the Big Ten Network, is the broadcaster of the league’s football championship game and won the first half of the conference’s media rights package at a reported $250 million per year. “They are creative, they’re really interested in big events, interested in big brands, interested in great production,” Delany said. The athletes will get input on any proposal, he said. “There has to be a plan that provides recovery, some rest and recuperation and social lives,” he said. 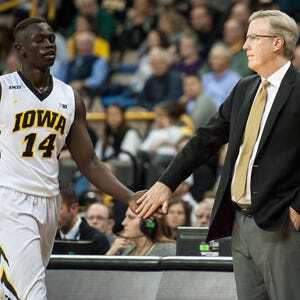 -- That the proliferation of transfers, particularly in basketball, needs to be addressed, something the Big Ten basketball coaches discussed at length here this week. -- That the football recruiting calendar needs to be moved up to reflect what is actually happening, with athletes being wooed at younger and younger ages and eager to be seen by more and more coaches. Delany argued for a comprehensive review of all recruiting processes, including the controversial satellite camps, which he doesn’t find problematic. “I do think that there needs to be a national method in recruitment that absorbs the interest of the student so that they can be seen by and learn about programs, whether it’s Boise State, or whether it’s Michigan, or whether it’s Alabama,” he said. -- That the Big Ten will continue to keep its football replay system in-stadium instead of having questionable calls reviewed at a central location, as the Southeastern Conference is experimenting with this fall. “The question is whether or not you go to a fully developed replay collaboration at a central location to get those eight or 10 back,” he said. Delany said that, if the SEC experiment is a success, he would rather see one central location for replay reviews across the country instead of on a league-by-league basis, similar to what several professional sports leagues are doing.